In this game you play as the Kerfluffles. Your goal is to infect all humans and turn them into Kerfluffles. 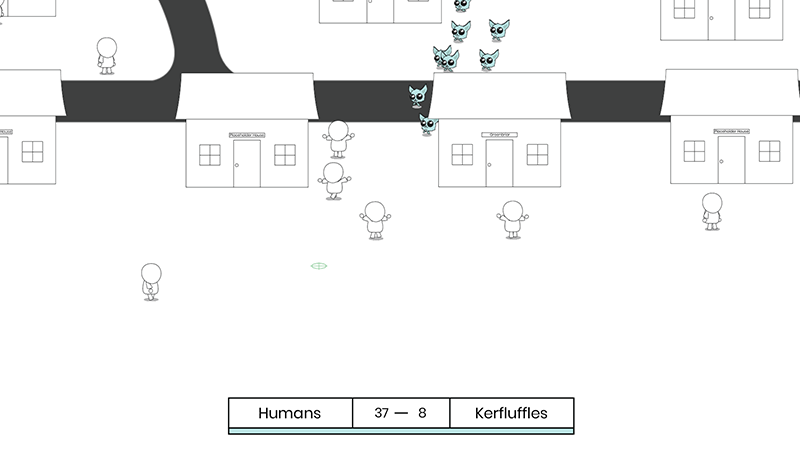 The plan is to have a open world neighborhood you can move your Kerfluffle army through and infect all humans and add them to your ranks. There may be some light puzzle solving such as dealing with armed humans, humans refusing to get out of their cars, humans in pools (Kerfluffles can't swim), etc. This gif is a very early test of animations and the basic mechanic. From here, I want to implement flocking behavior to allow a whole swarm of Kerfluffles to move around semi realistically, starting to design the environments, and getting the humans moving around. Agreed, the animations looks extremely good! Kerfluffles now properly move around where you click and bite humans. There's a bug where more than one kerfluffle can be biting the same human, but I think it makes sense, so I will just leave it in. From here, I need to make the humans move around a bit and then slowly build in little scenes such as a barbeque in someone's backyard that you invade. I won't be done with what I had planned by the end of the jam, but I think with the way I'm making the game, it will be playable more or less and I can add in more "scenes" in updates. Added very basic human movement and some placeholder obstacles. Hopefully will be able to build out the neighborhood in the next week. Definitely not going to be a completed game ever, but it was a good learning experience for steering behaviors. And maybe it'll be fun to chase humans around. It IS fun to chase humans around . The cuteness of the kerfluffles nicely offsets the gruesome action. The swarming behavior also looks good. Added a new type of human, Human With Baseball Bat. This human may run from you or run towards you and tries to hit you when you get too close. The bat can kill a kerfluffle theoretically, but I need to work on the balance. Made a main menu. Added music. I'm not sure how much more I'm gonna work on this, I still like the concept, but might leave it here for now. 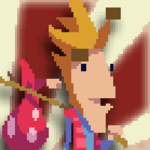 Maybe I'll do a continuation next wiz jam. - human with bat gets a bit closer before swinging. Also a bit of tuning to make bat a bit more effective. - Camera zooms out as kerfluffle numbers increases. - humans and kerfluffles no longer run off the screen and fixed bug where kerfluffles would warp to the other side of the screen. - adjusted spawn rate of humans to cap it at around 50-60 to avoid framerate slowdowns. Still might slow down tho at the end. - added win state and lose state. I like kerfluffle on white visual style a lot, and the animations are excellent. I could play with the main menu for ages!